The author of bleak and brutal novels like CONTINENTAL DRIFT, AFFLICTION and, his most recent, LOST MEMORY OF SKIN, set among the homeless of Miami, Russell Banks is not someone to turn to if you are in search of lighthearted or uplifting fiction. 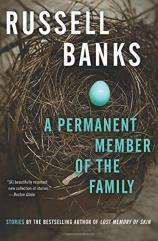 Banks has devoted most of his productive, if too little appreciated, career to chilly tales portraying characters on the margins of society, in jeopardy of losing their tenuous grasp on something even approaching normal life. That’s certainly true of most of those who populate the 12 stories (six of them never before published) of his sixth collection, A PERMANENT MEMBER OF THE FAMILY. “Former Marine,” the story that opens the book, is representative of Banks’s sensibility. The protagonist, Connie, who refers to himself as “the Retiree,” even though he’s “never officially retired from anything,” has lost his job at a Plattsburgh, New York auction house and now finds himself eking out a meager existence. His decision, explicable if not excusable, to turn to crime takes on a certain irony when we learn that his three sons all work in law enforcement. "It’s a difficult and unforgiving world, one where we wouldn’t want to live, and yet we’re fortunate to have [Banks] take us to visit it in these gritty and precisely observed tales." The male characters in other stories find themselves in similarly untenable situations. In the title story, 35 years after the “family legend” it recounts, the narrator, a college professor teaching literature in a typical Banks setting, a “shabbily quaint village in southern New Hampshire,” describes the “joint custody” arrangement involving the family dog and its tragic ending, as he tries to “reclaim the story, to take it back and make it mine again.” “Christmas Party” revolves around the decision of Harold Bilodeau, an excavator, to leave his double-wide trailer to attend the party his ex-wife is throwing at the beautiful home her contractor husband has built for her. Sheila, Harold’s ex, is “the past that wouldn’t top bleeding into his present, and as far as he could see, his future too.” And “Transplant” is the moving story of Howard, a divorced man and heart transplant recipient who agrees to meet the widow of the man whose heart has given him life. The concluding scene of the story is overpowering in its emotional impact. Even when Banks moves south, to Florida, his stories don’t get any brighter. That’s true of “Snowbirds,” one of the strongest in the book. Shortly after she and her husband move to the Biscayne Bay condo they’ve rented for five months, Isabel Pelham loses him to a heart attack. Her friend, Jane, leaves her home in snowy upstate New York to comfort what she assumes will be her grieving friend on the abrupt ending of her 37-year marriage. Instead, she finds “something weird going on with Isabel” and realizes she was “not prepared for her friend’s sprightliness or her suddenly fortified willfulness and new enthusiasms,” causing her to question the foundation of her own long-time marriage. The only story that feels out of place in this collection is “Big Dog,” a portrait of ego and envy. Erik Mann, a sculptor of “elaborate installations the size of suburban living rooms” receives a MacArthur “genius” grant that will pay him half a million dollars tax-free over five years. His decision to reveal the news of the award prematurely sparks a dinner party row of the sort that’s probably forgotten in the sober light of morning. 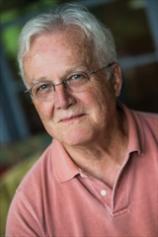 For most of the characters who populate it, the world of Russell Banks is a place of lost jobs, lost chances and, above all, lost love. It’s a difficult and unforgiving world, one where we wouldn’t want to live, and yet we’re fortunate to have him take us to visit it in these gritty and precisely observed tales.